Fiona Martin Deputy Director and Elizabeth Kane Learning Officer from the Learning and Participation team here at The Customs House work with Culture Bridge North East. Together we support cultural organisations (places like museums, galleries and theatres) and schools think about how they can support and deliver Arts Award. The Customs House is also an Artsmark partner organisation. The Artsmark Partnership Programme is an Arts Council England endorsed network of arts and cultural organisations that can support education settings on their Artsmark journey to embed arts and culture across the curriculum. The Dales School work with primary age children with a range of individual educational challenges including ASC, ADHD, Social, Emotional and Mental Health issues (SEMH), complex communication difficulties and other congenital and medical needs. The development of the whole child is at the heart of everything the school does. We believe that the skills, processes, knowledge, values and attitudes offered by the arts enable children to represent their experiences and respond to the world in a variety of ways. Authenticity and enjoyment are key features of our provision. This was a whole school team achievement; everyone played their part. From senior leaders to apprentices, enthusiasm and willingness to ‘have a go’, try new things and share ideas has allowed us to be successful. This continues to be instrumental to our success – we work to instil this mindset in our children. Governors and the Senior Mangement Team all play their part. This reinforces the value placed on arts as a way to improve standards and outcomes for every child at The Dales. The Dales are committed to responding positively to different needs and ideas to help each child to be the best that they can. A creative approach is essential to ensure equal opportunities for all to succeed. There are many reasons schools choose to go for Artsmark. As part of the process of completing Artsmark schools have to write a Statement of Commitment. Tracey explains about two of their priorities. These included celebrating children’s work and increasing the use of digital technology in the creative curriculum (the arts subjects taught in school). Celebrating Young People’s Work At the Dales School prioritised extending their creative curriculum to include more chances to celebrate achievement particularly in dance, movement, art and music in their school and outside. The Artsmark process helped them achieve this aim beginning with an audit that reminded staff of all the fantastic creative opportunities already offered in partnership with artists and organisation. It also helps schools think about their next steps. The Dales School have a history of working in collaboration with experts in arts and culture including artists, craftspeople and creative practitioners. Using Digital in the Arts The Dales now provides more chances for students to try photography and film-making. They also learn how to use computers, laptops and apps creatively. Importantly Tracey emphasises that it is students and teachers who have gained new skills and improved their confidence. The Dales School were awarded Artsmark Gold in 2014 and were thrilled to be awarded Platinum Artsmark in 2017. We are keen to continue to develop our creative practice. This includes exploring Arts Council’s 7 Quality Principles as a tool to review, develop, plan and evaluate our work. We are keen to look for more ways to involve parents and carers in our creative offer, sharing ideas and interests and working to break down the barriers to accessing the rich cultural offer of the North East. Artsmark has had a massive impact on The Dales School. Tracey has shared so many stories of how it has inspired every child and encouraged the school to get involved in international projects. We are currently involved in an Erasmus project entitled ‘Creative Learning in Action’ with colleagues from Germany, Denmark, Catalonia and Portugal. We are working to put the A in STEAM (Science, Technology, Engineering, Arts and Maths). Arts Award really promotes enjoyment and achievement, not just in the arts but also in the transferable skills which pupils develop. These include communication, willingness to try new things, sharing new skills with others. Some of our pupils arrive at school feeling that they have ‘failed’ in their learning. It is essential to build self-belief and esteem to enable learning to happen. Eight trained advisers help young people achieve at least one arts award at either Discover, Explore or Bronze level. Tracey notes Adviser training it great CPD for teachers. The school is set up as an Arts Award centre so completed Arts Award are submitted for moderation and certification through the school. So far children have completed arts award across the visual arts, dance and music. The Dales are also looking to introduce drama into the mix. Alongside the in-house Advisers Arts Award has been delivered with a huge range of artists and organisations including Nicola Balfour from the Barn at Easington, Baltic Centre for Contemporary Art; The Laing and Shipley Art Galleries;, Queen’s Hall Arts Centre; Circus Central; Bad Taste Cru, Bare Toed Dance and musicians from Jessie’s Fund. We are currently working with practitioners from Dance City and hoping to book workshops with Northern Print. Two teachers are currently enjoying CPD with Bamboozle Theatre Company. We are lucky to have school minibuses and so can visit different organisations and venues. So Why Artsmark Award and Arts Award? Do it! You’ll enjoy it. We (The Customs House) didn’t want to edit her words at all so we will finish with Tracey’s words. Arts Award gives us the opportunity to celebrate children’s learning in the arts and in their personal, social and emotional development. Pupils gain increased confidence in their ability, make choices and reflect on their learning. Communication and creative skills are increased. 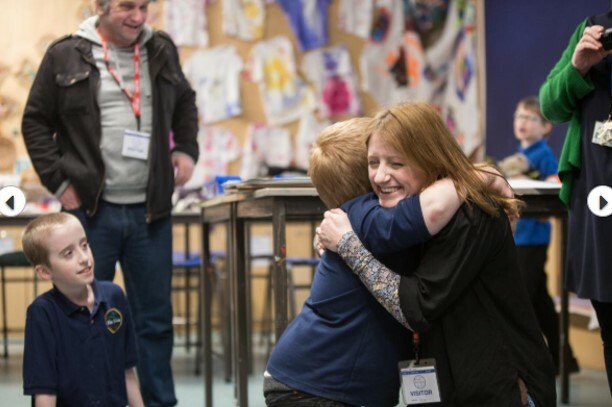 If you are a school considering starting your Artsmark journey contact The Forge here.